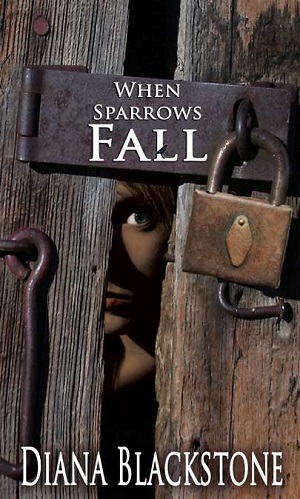 Diana Blackstone is the author of the middle grade/YA book "When Sparrows Fall." I grew up in a small family with just one younger sister, but my mom was born into an Amish-turned-Mennonite family and had 13 brothers and sisters. That’s a lot of aunts and uncles for me! I also have over 50 first cousins on that side. We spent a lot of time together when I was growing up, and I still consider my cousins some of my closest friends. I have always lived in the Pacific Northwest and miss the rain by the end of the summer. I am married with two sons, one just graduating from college and one in middle school. For over 20 years, I’ve taught at the same middle and high school from which I graduated. I’ve taught all grades sixth through twelfth, mostly English. Currently I teach sophomore English and serve as the school’s Academic Support Coordinator. My mom, sister, an uncle, a few cousins, and my oldest son also graduated from this school. My youngest son attends now. For fun I like to read, write, do word games, hike, cook new recipes, watch movies on Netflix, and see friends. A perfect winter day is stormy outside, but I’m inside on the couch with a blanket, an intriguing book, a hot beverage, and a cat curled up next to me. A perfect summer day is low ‘80’s on a lake or hiking with friends and family. I don’t like spiders but find them fascinating—just so they don’t get too close. I also don’t like crowds, getting up at 5:30 on school days, or grading essays. I’m a bit of a neat-freak and germaphobe. I know it’s kind of weird, but I like to wash dishes and organize. If I wasn’t a teacher or writer, I could be a professional organizer. Susanna, a young Mennonite teenager, struggles with new blended family dynamics under the shadow of an angry stepfather. After she discovers her neighbor’s dangerous secret, she is faced with a risky choice, one that could lead to devastating consequences. Since the protagonist is a 13-year-old girl, girls ages 10-15 would connect most easily to the main character. I think boys who are open to reading books with girl main characters would like it, too. Anyone who likes historical fiction and reading about challenging family relationships would also enjoy it. What inspired you to write a story about a teen who faces a crisis of faith? Questioning the faith we’ve grown up with is not only normal but even a healthy step toward owning our beliefs. It can be a scary process, especially when others tell us we’re wrong to have doubts and questions. I wanted to give voice to both the questions as well as the reassurance of God’s constant love for us, despite our circumstances, our mistakes, and our sometimes faltering faith. Susana discovers a strange nighttime visitor at her mysterious neighbor’s home, which leads to the unveiling of secrets. Without giving too much away, what can you tell us about this discovery? It’s a dangerous discovery reflecting a dark time in our nation’s history. To make matters worse, she’s faced with a terrible set of choices. One decision could lead to misery and even the deaths of others. The opposite decision could lead to harsh punishment from her stepfather, rejection by her community, even legal consequences. Tell us a bit about the protagonist, Susanna Stutzman. Susanna is a grieving girl who loves her family and does her best to support them despite facing backlash from others in her home. She is brave, curious, compassionate, and willing to take risks not only to protect others but to get answers. Many authors have influenced my writing style because I learn the craft as I read. The one author who inspired me to try writing my own children’s novel was Christopher Paul Curtis, author of Bud, Not Buddy. I thoroughly enjoyed that novel because of its simple, straightforward storytelling in the authentic voice of its young protagonist, brought to life with rich historic detail. I am far more aware of the words, phrases, and sentence construction that bog down fiction writing. Instructors in writing workshops repeatedly advise us to “show, don’t tell.” I get that now, and it’s coming much more automatically with practice. I’m trying to set the scene better. When I write, I see it in my head like a movie. I see the room, the placement of the furniture, how the light falls. I hear the clatter of dishes and the scraping of chairs. I forget that my audience is not in my head and might need help getting into the scene the way I am if I don’t share some of those details. I’m reluctantly embracing them. I think nothing will replace the feel of a regular book in my hands, but I am getting used to e-books. I have a collection now on my Kindle app. It’s nice to always have a book handy on my iPhone. My youngest son prefers to read e-books, and I’m just thrilled that he’s reading. I know I personally find it easier to swallow the cost of an e-book that I otherwise might not purchase in print because I’m not sure how much I’ll love it. As an author, if I make more sales that way, then I’m glad this option exists! In the next five years I hope to finish and pitch two more novels I’m in the process of writing. I also hope to have more time to develop my blog. At the end of those five years, I plan to retire from teaching or at least go to part-time to have more time for writing. I currently have more ideas for novels than I have time to write them. It will be a relief to get the stories told so that their characters will settle down and quit bugging me all the time. I am almost finished with a contemporary YA novel with the working title Lucy’s Place (likely to change as I’m not satisfied with that). It’s about a Guatemalan-born girl named Lucy, adopted by a single white mother when she was little. Not long ago, her mother married, and Lucy had to change schools. She also learns her mother is pregnant. As Lucy struggles to find where she fits in both at school and at home, she meets Jack. Is he a dream-come-true or is he a nightmare? Will she find her place and get her happy ending? I’ve begun a third YA novel titled Testimony of Crows, a paranormal story with two teenage protagonists who live 100 years apart but in the same setting in the Oregon coastal mountains. In addition to living in the same place, they both harbor dark secrets of terrible guilt. How are the girls connected? Can they help each other find redemption? Be sure to check out the glossary at the end. Pennsylvania Dutch words appear in the book, and I want kids to know that resource is there if they need help figuring out what the words mean.